The Tenth Anniversary of the founding of the Society was noted by Edward H. Kraus in a paper, "The First Ten Years of the Mineralogical Society of America", published in the American Mineralogist, v. 15, pp. 98-103. There was no public recognition of the the Society 25th anniversary. The last MSA Annual Meeting and Council was December 28, 1941 and the next was not to meet until December 27, 1945. However, there was one intervening Council meeting in December of 1943 of those present in New York City that was needed to conduct the necessary affairs of the Society. At that meeting there was recognition of the upcoming 25th anniversary by the somber note in the minutes that "In case the war is over (in 1944), a meeting was authorized to recognize the the Twenty-fifth Anniversary of the Society". That condition was not met. 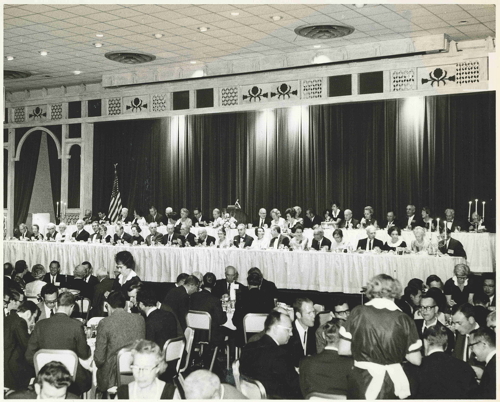 There were several events to celebrate MSA's Fiftieth Anniversary with the culination being the Annual Meeting on November 8 and 9, 1969 in Atlantic City, New Jersey. 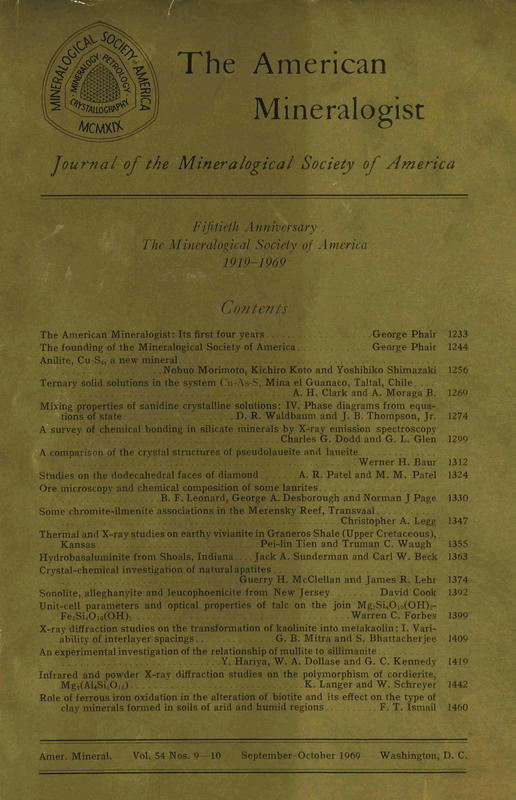 A special issue of the The American Mineralogist with a gold cover and two articles by the MSA Archivist, George Phair: The American Mineralogist: its first four years and The Founding of the Mineralogical Society of America. 50th Anniversary Symposia, with Harry H. Hess of Princeton University as chairman of the symposia committee. He personally organized the sessions for a symposium on the "Mineralogy and Petrology of the Upper Mantle"". 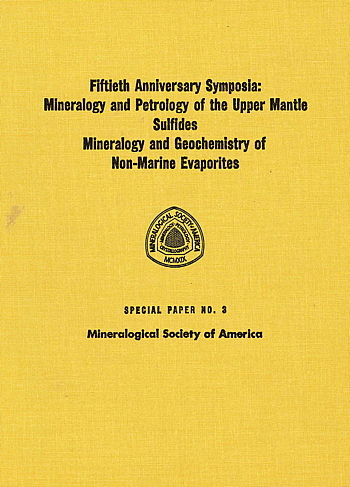 A symposium on "Sulfides" was organized by Gunnar Kullerud of the Geophysical Laboratory, and a symposium on the "Mineralogy and Geochemistry of Non-Marine Evaporites" was organized by Blair F. Jones of the U. S. Geological Survey. The presentations of the Fiftieth Anniversary Symposia at the Annual Meeting that were separately published as MSA Special Paper 3. The penultimate event was the Fiftieth Anniversary Celebration Jubilee Banquet with a special program. The MSA 75th Anniversary Symposium, cosponsored by the 1994 GSA Annual Meeting Committee, was held on Wednesday afternoon, October 26, 1994 at the Washington State Convention & Trade Center, Seattle, WA. The symposium was convened by W. Gary Ernst, Stanford University, and focused on the current advances and changing trends in mineralogical research in six 40 minute presentations. There were several other symposia during the annual meeting. On Monday afternoon, Peter Heaney, Princeton University and Patricia Dove, Georgia Institute of Technology, convened “Advances in Silica Geochemistry." With the Geochemical Society, MSA sponsored a symposium in memory of Andrew J. Gratz entitled, "Frontiers of Mineral Surface Geochemistry" held on Wednesday morning and convened by Michael F. Hochella, Jr., Virginia Polytechnic Institute and State University. The 75th Anniversary MSA Reception was Tuesday, October 25 at The Space Needle Skyline Level from 5:30 to 7:30 p.m. In celebration of the 75th Anniversary, the reception was expanded to include a sampling o’hors d'oeuvres as well as the usual beer, wine and soft drinks. There was a ticket cost, but reception was free for student members! As in previous years the reception was held jointly with the Geochemical Society.